“Free Solo” is hard to watch. This is not, however, simply because “Free Solo”, as the title implies, chronicles a free solo rock climber, 33 year old Alex Honnold, meaning one who climbs rocks well above safe heights without ropes or any other kind of protective equipment, comically yet terrifyingly described by one rock climber as akin to an Olympic Gold Medal event where failure to win the Gold Medal means death. It is hard to watch because of this, certainly, but “Free Solo”, directed by Elizabeth Chai Vasarhelyi and Jimmy Chin, is not content with mere stomach-churning mountaineering spectacle. Whereas the similarly themed “Sunshine Superman” chiefly evangelized for its subject of BASE jumping, and whereas the superb “Man on Wire” romanticized its death-defying wire-walker to the extreme, “Free Solo” picks the notion of thrill-seeking apart. Hoary observations about cheating death being part and parcel to Honnold’s dream are not allowed to slide, transforming elementally rousing images of Honnold as a mere speck against imposing granite into emblems of deliberate isolation. The documentary turns on Honnold’s attempt to become the first person to free solo Yosemite’s 7,500 foot El Capitan, which Vasarhelyi and Chinn do a nifty job of setting up before it arrives as the film’s climax by way of computer graphics and tagging along on their subject’s test climbs so that when Honnold makes his history making assault we are not struggling to keep up but able to sit back and not so much enjoy the ride as just figuratively hold on for our lives. That ride is relayed through aerial photography peering over the top of El Capitan that will make your stomach drop as well as you-are-there camerawork from the rocks right alongside Honnold. Throughout this sequence, Chinn and his camera operators are seen on screen, watching right along with us, which is not so much the filmmakers imposing themselves on someone else’s story as an extension of the overall story itself. 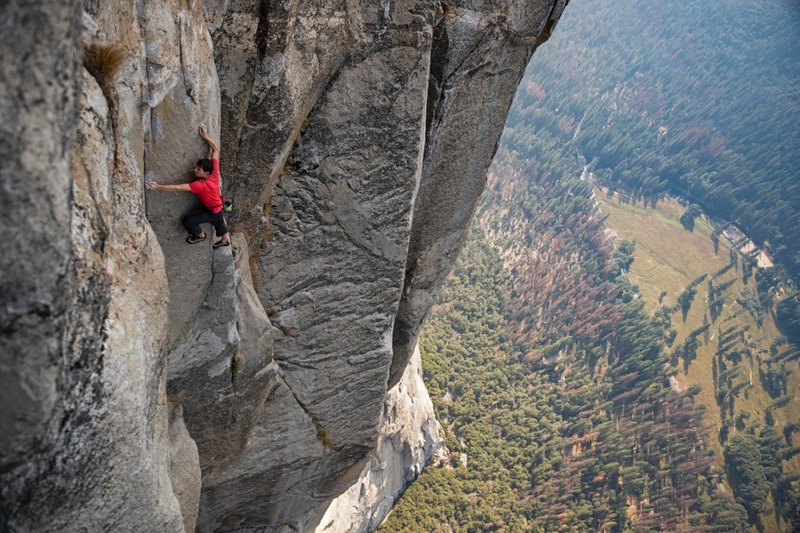 Chinn and his crew debate the ethics of filming Honnold’s climb given the real-life stakes. You might take umbrage with the ultimate decision given that the movie is a thing you are watching because it exists, but still. It’s nice to see the question wrangled with honestly on screen rather than perfunctorily at a Q&A. Chinn even asks Honnold if the climber wants his crew to stop filming, which comes across genuine rather than drama for the camera, and which Honnold parries by observing that, hey, he could just go off and conquer El Capitan in private. Philosophically, I found myself half-wishing that he would, leaving the doc as a kind of cinematic Sagrada Familia. Honnold himself wrestles with the idea of whether his yearning to free solo El Capitan is an honest one or mere navel-gazing for the camera, a fascinating question given the state of our all-access world, and one where “Free Solo” might have been better to dig deeper. At the same time, Honnold willingly places himself under the microscope, having an MRI done all in the name of which leads to a fascinating moment where his thrill-seeking is lent scientific credence as we discover his amygdala, the part of the brain responsible for decoding emotions, requires great stimulus to be engaged. This revelation colors Honnold in a completely different light, his lackadaisical air snapping into focus, his eternal bed hair becoming a tonsorial symbol for sort of sleepwalking through regular life. And it illuminates his romantic relationship with Sanni McCandless, presented in refreshingly candid terms onscreen, her confessionals alternating between acceptance and exasperation. They genuinely seem to love each other even if there is a palpable sense that they cannot quite completely connect. Indeed, as the El Capitan climb draws nearer, you can literally see him growing distant from her and shutting down in their conversations, given additional weight by the close confines of Honnold’s living situation in a motor home, the camera painfully close, establishing a photographic harmony with so many intimate mountainside shots. In the end, he pushes her away from what he sees as pure necessity to achieve his feat. It’s cruel, and the movie never acts like it isn’t, even undercutting his supreme moment of triumph by sort of turning the admission that he never smiles this much inside out, evoked in a solemn reaction shot of McCandless in the wake of this elation, leaving you with the unspoken truth that free soloing will always make him happiest. At one point, in voiceover, Honnold cites the warrior mentality, “where you give something one-hundred percent focus because your life depends on it.” Vasarhelyi and Chinn underline observation with shots of a cloud-consumed El Capitan, suggesting the apexical (sic) conclusion of “Crouching Tiger, Hidden Dragon.” His words come across ridiculous; his words come across real.